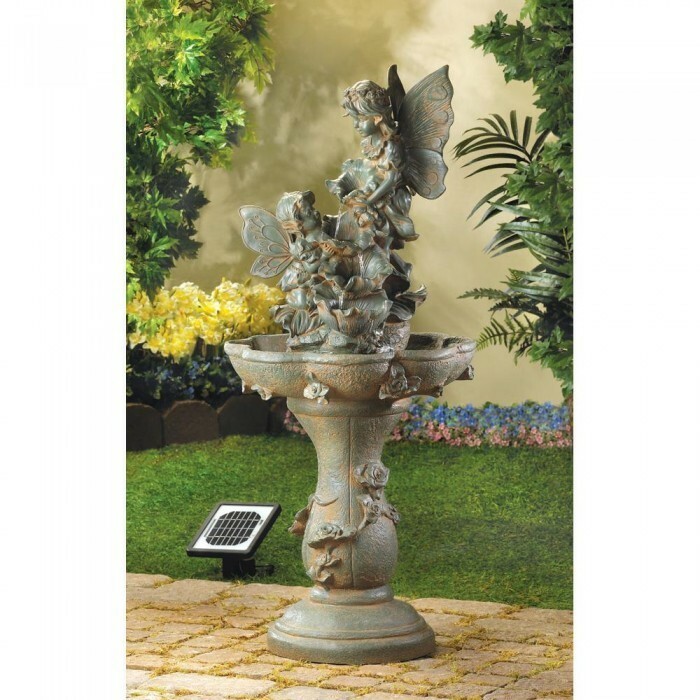 FAIRY SOLAR WATER FOUNTAIN by Cascading Fountains home decor, jewelry, decor, decorations, electronics, fountains, floor mats, art glass, vases, garden essentials, fireplace screens. Fabulous fountain features a scene from treasured childhood tales, as a pair of fairies plays in the crystal waterfalls. The magic of solar power lets you add this fountain to your favorite spot without tangled cords, or an optional electrical plug for overcast days. Submersible water pump included. Due to the size and weight of this item, we are ONLY able to ship it within the Continental United States, to physical address locations, and only via UPS Ground. Material(s): POLYRESIN SAND STONE POWDER SOLAR PANEL. Weight 25 pounds. 17 1/2"" x 17 1/2"" x 41 3/8"" high.